In Ghor, Afghanistan, more and more women have decided to get behind the wheel – a trend not welcomed by all in the traditional province. Angela Sharifi started learning to drive a year ago. She says she is quite good now and has much more clutch control. “It is much easier than you think it is in the beginning,” she says with a smile. In other countries, a woman sitting behind the wheel of a gray Toyota Corolla might not be an unusual sight. But in Afghanistan, Angela is a rarity. “You see the men standing around on the streets, staring with open mouths. They are so surprised all they can do is stand there and watch,” she says. “They look as though they’ve seen a ghost. Some men even say it is a sign the end of times are coming,” she says laughing. Angela is a member of the provincial council in Ghor. She knows how to assert herself in a male-dominated society. Luckily, it is not only the men who stare at her, and at least they don’t bother or insult her, she says. She adds that her husband helped and supported her while learning to drive. 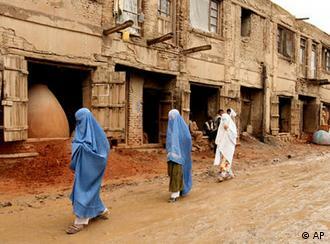 Chaghcharan, the capital of the Ghor province, is not a very developed town. It is very traditional and it has less than two kilometers (1.2 miles) of paved streets. The country has a total of about 12,350 kilometers of paved roads. There are no street signs along the way. Sayed Mohammad Hasin Khan, head of Ghor’s driver and vehicle licensing agency, says that two more kilometers of road are going to be paved by autumn. In addition to that, signs will also be put up. Hasin Khan believes the region will eventually have a developed infrastructure for cars. Traffic laws will then be learned and tested in a theoretical and practical examination. “The driver license test will be the same for men and women – they will be treated equally,” he emphasizes. 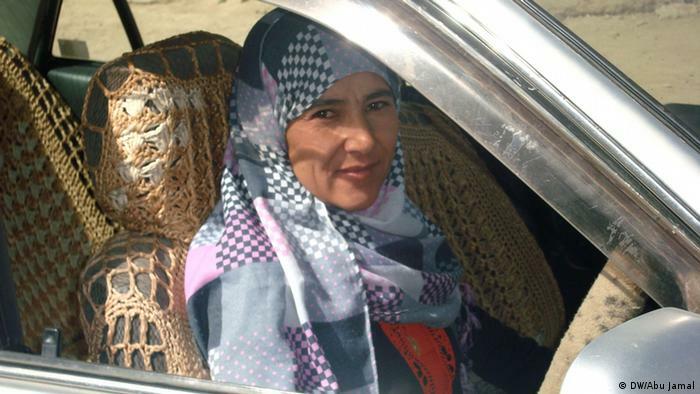 Nonetheless, spotting women behind the wheel is still a new phenomenon in the province of Ghor. Some people see it as the beginning of the end, and others think it is a sign of creeping Westernization, points out Dr. Aql Sharifi. He is responsible for the protection and development of women’s rights of the Human Rights Commission in Ghor. He says an increasing number of female students have licenses and even their own cars. Opponents and advocates of the phenomenon do agree on one thing: women driving cars in Ghor – whether they are seen as bad omens or as revolutionaries – will continue to be an oddity for a while yet. Bibi Hakmeena stands out in a crowd of Afghan women – she is a politician one who not only dresses as a man, but who garners the respect of men and was recently voted onto a provincial council. 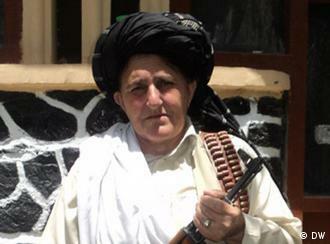 There is no escaping talk of Bibi Hakmeena in the eastern Afghan province of Khost. The provincial council member’s name is on everybody’s lips – both because of her political work and her unusual mode of dress. Unlike other women, she wears a knee-length shirt, loose-fitting trousers and a black turban. And as such, she is barely distinguishable from the men with whom she mixes. She has been dressing in traditional men’s clothing since the 1979 Soviet invasion. She was just 10 years old at the time. With her older brother away studying in Kabul, and her younger brother too young to take up arms, there was a shortage of men to protect the family. To get around the problem, her father decided to masquerade his eldest daughter as his son. The politician, who is now in her early forties, became responsible for the protection of her mother and younger siblings. 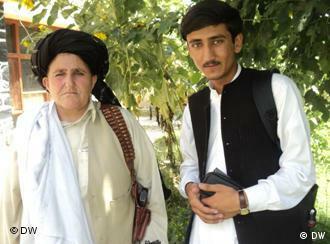 And she also started to accompany her father into the world of Pashtun men. She supported the Mujahedeen in the fight against Soviet occupation, operating as an informant and organizing supplies of food, medicine and even weapons. These days she never leaves her house without her Kalashnikov over her shoulder. Bibi Hakmeena, who has never taken the traditional female route to marriage, was recently voted onto the provincial council. Her mediation skills are in great demand, and she enjoys the respect of both women and men. He says that commitment sets her apart as an innovator in a region where women have long been neglected. But Bibi Hakmeena does not fight her battles from a gender platform per se. She simply wants to use her political clout to help the disadvantaged – and in Afghanistan, they often happen to be women. On that front, the politician speaks from experience. Rather than attend classes, she was taught to work the fields, just like a boy. 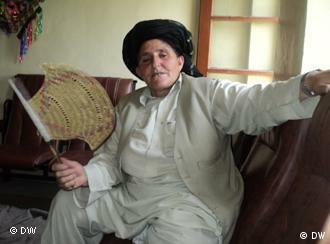 She calls herself “king of the women,” and Khost residents are the first to admit that she is a man as any man. Even in the face of the Taliban. Hakmeena describes herself as religious, but she also believes in the law and democratic jurisdiction. As far as she is concerned, dialogue is the best way to solve conflict, and she hopes it will prevail as a solution in her war-ravaged homeland. She also hopes to see more Afghan women getting ahead and securing themselves equal rights without first having to become men. Bibi Hakmeena ist eine Frau. Aber sie lebt in Afghanistan wie ein Mann. Die Provinzrat-Abgeordnete im ostafghanischen Khost, die sich als “König der Frauen” bezeichnet, wird von Männern respektiert. Wenn man nach Khost, in den Osten Afghanistans fährt, kommt man nicht um sie herum: Bibi Hakmeena. Der Name der Provinzratsabgeordneten ist in aller Munde. Nicht nur aufgrund ihrer politischen Arbeit, sondern auch wegen ihres ungewöhnlichen Aussehens. Sie trägt das traditionelle Gewand der Männer, eine weite lockere Stoffhose und ein langes Hemd, das bis zu den Knieen geht. Auf dem Kopf trägt sie einen Turban. “Ich fühle mich wie ein Mann, weil meine Gewohnheiten männlich sind. Ich habe mich nie wie eine Frau gefühlt”, erzählt Bibi Hakmeena. Seit ihrer Kindheit kleidet sich die inzwischen 40-Jährige wie ein Mann. Auf ihrer Schulter trägt sie ihr Gewehr, denn ohne die Kalaschnikow gehe sie nicht aus dem Haus: “Ich trage diese Waffe für mich, für meine Ehre und mein Ansehen. Paschtunen haben ein Sprichwort: Die Waffe ist eine Last, aber sie wird dir irgendwann zu Gute kommen. Die Waffe ist dafür da, dass man sein Leben beschützt”. Schon als junges Mädchen musste Bibi Hakmeena lernen, sich selbst und ihre Familie zu beschützen. Weil ihr großer Bruder in der Hauptstadt studierte, musste sie als jüngere Tochter den Platz des Sohnes einnehmen. Es wurde zu ihrer Aufgabe, die Mutter und die Schwestern zu verteidigen. Und sie begleitete ihren Vater in die gesellschaftlichen Domänen der Männer: “Mein Vater war der Dorfälteste. Ich habe ihn auf “Dschirgas”, den Versammlungen, begleitet und dort viel gelernt. Der Stamm hat mich aufgrund meines Vaters immer schon respektiert”, erinnert sie sich. Bibi Hakmeena hat nie geheiratet. Statt Kinder zu gebären, hat sie mit den Mujahideen gegen die Sowjets gekämpft: Sie war Späherin und sorgte außerdem für den Nachschub von Nahrung, Medizin, aber auch von Waffen. Bibi Hakmeena ist zwar religiös, sie glaubt aber auch an das afghanische Gesetz und die demokratische Rechtssprechung. Der Dialog zwischen verfeindeten Parteien ist nach ihrer Überzeugung die beste Lösung. Die Hoffnung auf Frieden für ihre kriegsgeschundene Heimat hat sie noch nicht aufgegeben. Sie hofft darauf, dass sich Frauen stärker emanzipieren. Denn auch nach dem Sturz der Taliban im Jahr 2001 erfahren Frauen und Männer keine Gleichstellung in Afghanistan. Um um die gleichen Rechte zu bekommen wie ein Mann, muss eine Frau erst zum Mann werden.